By Ken Silva pastor-teacher on Aug 11, 2010 in AM Missives, Current Issues, Features, Homosexuality/"Christian"
Apprising Ministries continues covering the sad saga of Anne Rice because it’s also an indicator of evangelicalism, in very much the same way as gay affirming “pastor” Jay Bakker Reflects The Sad Condition Of The Visible Church. In addition, as I said in Anne Rice In Apostasy, if she would drop this and move, then I wouldn’t have to continue to expose her in her apostasy; but she hasn’t. Like this should come as a surprise with her doing interviews all over the landscape. 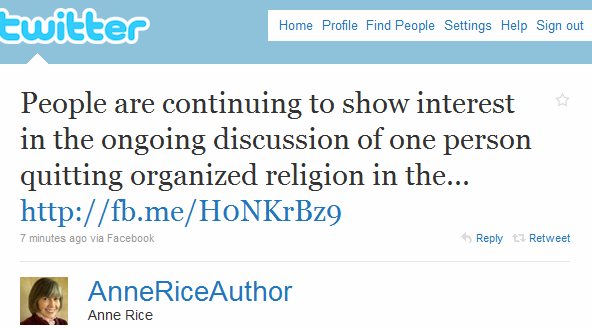 As a further example, from today, we have Anne Rice: Best-Selling Novelist Explains Catholic Church Exit by ABC News. They tell us: Watch Dan Harris’ interview with Anne Rice today on “World News” at 6:30 p.m. and watch the full story on “Nightline” at 11:35 p.m. ET” while also supplying the video seen below. Well, I find myself wondering what heretical quasi-universalist Emerging Church pastor Doug Pagitt, who heads Solomon’s Porch where the equally heretical Tony Jones is his “theologian in residence,” would have to say if it had been me who had spoken those incendiary words above. The way Rice seeths about “Christians, as a group,” we’re left wondering; would this be all Christians in general? Nope; as I pointed out in Anne Rice And Homosexuality, it turns out it’s just the Bible-believing Christians who are truly committed to the actual Jesus. As far as the video, essentially a commercial for Rice’s latest book, Chris Connelly chats with Rice; he tells us she “returned to the [Roman] Catholic Church in 1996.” Rice offers that with the new book she wanted to “create a probable reality for the Jesus of the Bible”. She does make a telling confession as she explains that she wanted to take “the Jesus I believe in” and construct her own ideas about what He might have been like. Connelly does also point out Rice’s “commitment to Catholicism,” which is key to this story; Rice has no Christian testimony. I knew it was gonna to be difficult–my son is gay–he’s a gay activist, a gay novelist. Connelly: Some people would say he’s going to hell. But this is the danger of making up your own personal Jesus; Anne and Christopher are both in rebellion against the one true and living God of the Bible, and they have currently entered through the wide gate that Jesus warned leads to destruction (Matthew 7:13). If we love Anne and Christopher Rice, we don’t affirm them in their sin; we pray God will send people across their path to preach to them the Gospel of repentance for the forgiveness of sins in Jesus Name; and further, we pray that they will accept it.